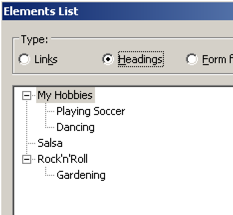 Iframes allow to include any external content into a page. As such, precaution must be taken that external content does not mess up the semantics of the surrounding content with improper heading levels and hierarchies. In general, screen readers treat content in an iframe like any other content on the page. JAWS also announces the iframe's title attribute, so be sure to always provide a meaningful title to an iframe. Also, both NVDA and JAWS allow navigating directly to any frame using the m key. These all are activities I love to do on a regular basis. Soccer is a team sport played between two teams of eleven players with a spherical ball. Gardening is the practice of growing and cultivating plants as part of horticulture. Screen readers integrate headings from iframes directly into the heading outline of the parent page. This means that you have to be very careful that an embedded content's heading does not badly affect your embedding page's heading outline. 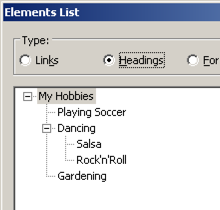 The following bad example illustrates what can happen: the embedded content is meant to be part of the heading on level 2 "Dancing", but it defines its own headings on level 1. To fix it, the headings in the embedded content need to be on the correct level relatively to the parent page.